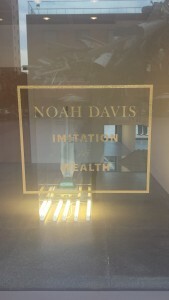 I first heard of Noah Davis when he died last August at 32 years old. I tweeted that his death was “a loss,” but I’d never seen his art. Despite the fact that Davis was a renowned artist, I went to see his Imitation of Wealth installation with relatively low expectations. I am generally more comfortable with public history rather than art exhibitions, especially contemporary or abstract art. 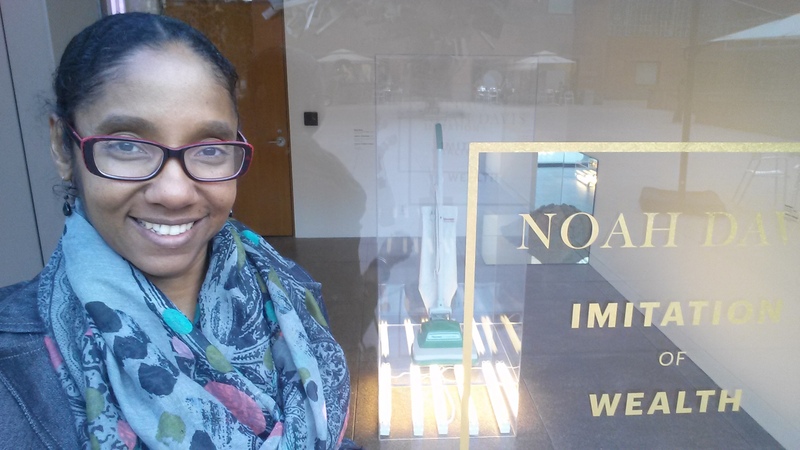 Plus, I had seen some photographs of the exhibit, and I just had very little desire to look at a vacuum cleaner behind some glass. 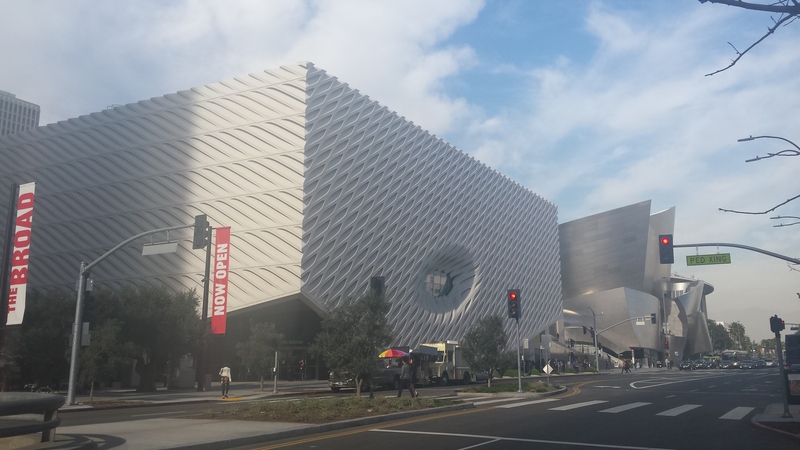 However, I was pleasantly surprised by the pleasure I got from this exhibit on display on busy downtown Los Angeles’s Grand Avenue in the “storefront” space of the courtyard of LA’s Museum of Contemporary Art (MOCA). On Friday afternoon when I went, MOCA’s courtyard was quiet. 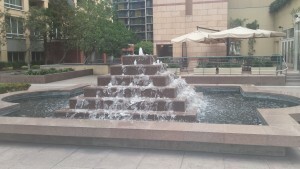 There is a fountain catty corner from the storefront, and the sound of water running provides a wonderful, tranquil atmosphere for enjoying art. I first read the summary of Davis’s work in general along with Imitation of Wealth. 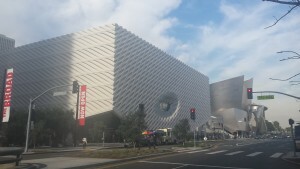 The summary describes The Underground Museum, which Davis developed, that opened in 2012, in a Black and Latino working class LA neighborhood far from LA’s affluent museum districts. For his museum’s opening, Davis had difficulty getting loans of the type of “museum quality” artwork he wanted, so instead of being deterred, he created his own, and Imitation of Wealth was born. For this installation, Davis recreated works by several well-known artists including Robert Smithson, Dan Flavin, and On Kawara. I was not familiar with any of these artists, so I had fun Googling them and comparing Google’s images with the works before me. The summary also points out that the title of Davis’s exhibition alludes to the 1934 film and1959 remake of the film, Imitation of Life, a tragic story about a woman’s experiences passing for White, which I have not seen but is familiar to me because it is alluded to in one of my favorite novels, Toni Morrison’s The Bluest Eye. Each piece in the installation is titled “Imitation of ________” with the name of the original artist in the blank. Exploring the installation left-to-right, the first piece was “Imitation of On Kawara,” a recreation of a piece from Kawara’s Today series. In the series, Kawara painted the date of the painting on a canvas in the language of the country where he was painting. Ironically, the date of Davis’s “Imitation,” October 7, 1957, comes before Kawara started the series in 1966. I have been unable to discover anything special about this date in history, so how Davis selected that date is likely to remain a mystery. Davis also recreated some”readymade” works like the bottle dryer from Marcel Duchamp and a piece from Koons’s vacuum cleaner series. He also recreated a similarly minimalist piece by Dan Flavin composed of one fluorescent tube and another by Robert Smithson from his corner mirror series made up of mirrors in a corner with mound of dirt piled on top. I was most surprised by the beauty I found in these minimalist recreations. I enjoyed finding my legs and feet integrated into the “Imitation of Robert Smithson” corner mirror piece. I enjoyed contemplating the date on “Imitation of on Kawara.” I even enjoyed puzzling over the “readymade” bottle dryer as a work of art. Giving new audiences (like me) access to these well-known works of art was surely part of Davis’s purpose.